Before we talk about this latest giveaway, let me say something about my outfit first. I know, I know. 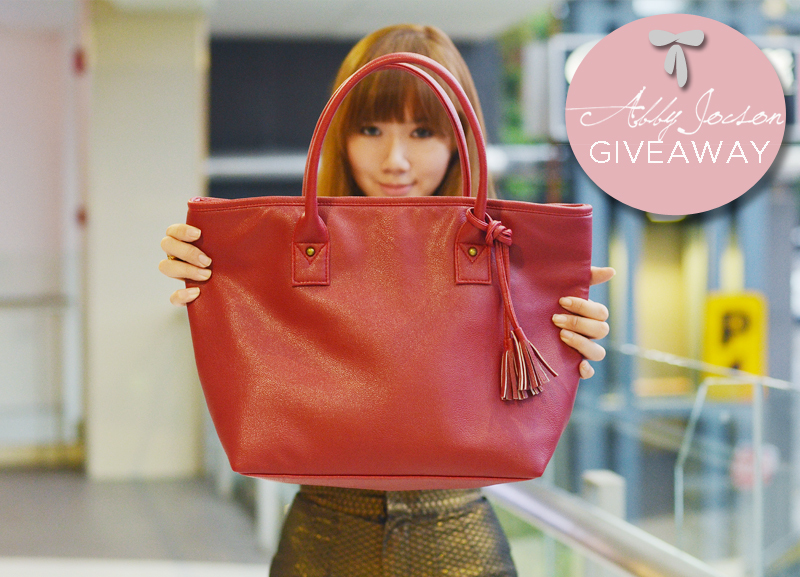 You really want to know how you can score this red tote. Hold your horses! This will be quick. I promise! It’s already been a habit of mine to raid my mom and my sister’s closets whenever I feel like I’ve run out of clothes to wear. Now before you judge me and shout “ugh Camille, you hypocrite,” let’s get real. Us girls, no matter how big our collection is, there will always be days when you feel like you’ve got NOTHING to wear. Hello, have you watched The Rachel Zoe Project? Even she has days like this and my closet is nothing compared to hers. Today was one of those days. So whose closet did I raid? Mom’s the victim this time around. My mom and I share the same love for buttondowns and prints. She wears a bigger size but I make do. Isn’t it fun living with 2 other women in the house? Since this is a bag giveaway, I styled my outfit according to the bag. It’s pretty easy actually. The bag is the perfect everyday bag– size is just right; design is a classic; and the color isn’t hard to match. These are actually the reasons why I chose this bag for the giveaway. Just a little info on Abby Jocson, all her items are proudly Filipino made. The brand sells mostly chic tote bags like this and a few accessories as well like cellphone pouches. Like Designs By Abby Jocson on Facebook and follow @abbyjocson on Twitter. Leave a comment below with your name, Twitter name and link to your tweet. Deadline for entries is on December 1 at 11:59 P.M. This contest is open to Philippine residents only. Again, no multiple entries please. The winner will be chosen via Random.org and announced here, so make sure to check the comments section after the deadline. Good luck everyone! A month and 4 days to go before Christmas! Woohoo! How do you Phillipine bloggers get everything right? You have huge closets and a standing reputation, and you always manage to look great and feel comfy on sick days. And how the heck do you get the money and energy to go shopping every other day, while styling and building stores at the same time? You must be gifted with superhuman capacities, because this is just beyond me. wiiiiihhhh! it seems that you know that december is my birth month?advance birthday gift eh?! thanks camille!! i like the top <3.. Mom is bigger also pero nagagawan ng paraan yan haha! Please don’t forget my fan sign! I will not stop sending P.S.’ until you make me 1 lol <3 thankies! i wanna win that bag!!! is it possible na manalo ulit sa giveaways nyo ms. camille? I super agree to you Miss Cams, na sometimes I got nothing to wear even though I have lots of cloths :-) and my mom’s closet is my victim also. :-D and every time that day comes my mom always says “napaka dami mong damit dya, manili ka nalang ng kahit ano” and my dad says “yan ang mahirap sa sobrang dami ng damit, wala ng mapili” :-D hihi. btw, i love you short, and that bag is gorgeous. Haha my mom says that too! :) Thanks Jhaycee! below with your name, Twitter name and link to your tweet. Omgggg your top and your shortssss <333 Pwede give away din yun ate Cams? Hahahaha! Kidding :D As usual, great outfit. Sooo wearable! Thank you thank you for another inspiring outfit :D :* Btw ate Cams, your hair looks diffrent here. Kakapagupit mo lang ba? I noticed kasi ang iksi ng bangs mo na dito :D Haha! WOw Camille.. Like u, your mom’s got a good taste in clothing.. I wish u could giveaway that top too.. haha.. Thanks Abby! She’ll kill me haha! really sorry i wasn’t able to put the link , i misread. Hmm! I thought of wearing something like this one on a casual party? What do you think? It’s a casual party so pretty much anything goes! :) Go for it! Actually, I was more interested in your outfit than the giveaway.. haha.. cuz I’m not from The Philippines.. so I’m here for your outfit, Ms Camille.. =D but the tote is gorgeous though.. might check it out if i visit The Philippines.. is it sold in the mall? oh i see.. only online? hmm..
Hope I win,. I really want a RED bag, such a sceen stealer. Classic and Most sought of after! Red bag gives a bold fashion statement and depicts a woman’s sense of style. I love how you acknowledged your readers by simply leaving us a message. It gives a sweet personal touch. You are AMAZING! ♥ Love you more, Ms Camille! Wow!You’re outfit is my bet and I so loove bags.joined. oh how I love to own that kind of bag! Oh yes! I forgot to link! :) Updated! I love the red accents of your outfit, looks sooo nice with the bag! I love ur style cammile its such a simple and stylish going out wear …i wish i can be that too,this red bag does have the ”it” factor!